For the past few years, I’ve led photography workshops all over the United States. It’s been a blast getting to know students from all walks of life and helping them to improve their craft. One of the most common things I’ve noticed after teaching these workshops is that composition is one of the hardest things for people to grasp and it all typically comes down to one reason: not spending enough time composing the scene before taking the shot. It’s easy to see why photographers fall into this trap so often. When you’re at an incredible location, and the light starts to peak, it’s almost like a countdown begins in the back of your head. You feel like you have to work frantically to get as many shots in as you can before the light fades so instead of thoughtfully composing a scene, you are working against the clock to fill up a memory card with as many shots as possible. There’s plenty of truth to this mindset: The light doesn’t last long, sometimes peak light begins and ends within 5-10 minutes, but a lot of this can be fixed with proper planning and a change of mindset. Here are a few tips for composing scenes the next time you’re out shooting. When it comes to photographing landscapes, I found that shooting on a tripod and using the live view screen drastically changed the way I approach a scene. Something about hand holding a camera and looking through the viewfinder causes me to almost rush taking a shot. But when I get the camera on a tripod, see the scene through the camera’s lens by looking at the screen on the back, I’m able to slow down. Instead of quickly moving my hands, arms and body around to compose, I have to make small, calculated adjustments with the tripod. This shift allows me to really investigate a composition and see how it’s all coming together. I can look for potential leading lines in a scene and then move the tripod around to make the leading lines more dominant. I wrote an entire article on this topic here at AlphaUniverse.com and I encourage you to check that out as well. Earlier I mentioned the issue of feeling like you’re fighting against the clock and you feel the need to get as many shots and different compositions in before the light fades. Well, that rushed mindset usually comes from not getting to a location early enough to scout and have your shots figured out beforehand. If you get to a location early, you can do all the rushing around and looking for compositions while the light isn’t great. That way, when the light does get incredible, you already have your spots picked out. When shooting wide angle landscapes, you really need to have a strong foreground element to draw the viewer into the shot. In the shot above from Banff, Canada, there weren’t any foreground objects to use besides the lake. Are there any objects or natural features in the landscape to lead the viewer’s eye to the main part of the scene? For the photo shown in this column, I was to position myself along the edge of the snow where it met the water and use that hard edge to lead the eye into the frame toward the mountains. Is there a way to use negative space to simplify the composition? In this case, the negative space of the water was a perfect candidate to create a somewhat minimal composition which helped the Mt. Rundle to really shine and steal the show. I also did a long exposure (15 seconds) to smooth out the water and add some motion blur to the clouds giving the scene a more ethereal feel. The basic premise with the rule of thirds is to keep the horizon out of the center of the frame unless the composition demands it (which is rare). Therefore, you always want to go have ⅔ foreground and ⅓ sky or vice versa. If the sky is more interesting than the foreground, go ⅔ sky and ⅓ foreground. But the rule of thirds doesn’t only apply to the horizon. I also used this rule by placing the snow on the left third and the water in the other two thirds. So it’s ⅓ snow and ⅔ water. To take it a step further, try and make sure there’s something interesting in every block of your image. A thirds overlay in the viewfinder or LCD shows nine blocks from dividing the frame into thirds left to right and up to down. Try to fill each of those blocks with something interesting and chances are good you’ll make a great image. The viewer needs to know what the subject of the photograph is. Is it obvious? If not, use the previous steps to make it obvious. In the photo above, Mt. 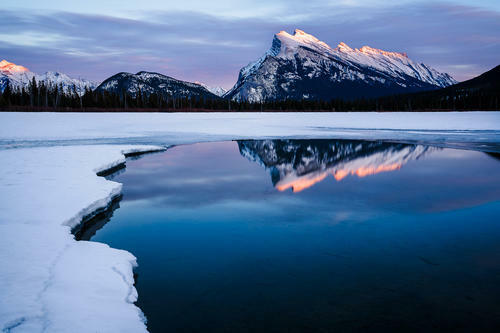 Rundle is the clear subject but the surrounding scene is also beautiful and eye-catching. That said, you wouldn’t look at the photo and think it’s a photo of a lake or snow, even though they’re in the foreground. Everything leads to the mountains, and that was achieved through thoughtfully composing the scene. There are plenty of other things going through my mind when composing a scene as well, but these are the basics and a great place to start. Now get out there and create something awesome!